This cute camping-themed bulletin board will give students a warm and furry welcome! 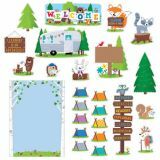 Set includes welcome sign, large vintage trailer, 36 student pup tents, 6 woodland animal accents, 2 large trees, and more. Pieces range in size from 17" x 71⁄2" to 53⁄4" x 33⁄4". 51 pieces. Bring the feel of nature to your bulletin boards and classroom displays with these Wood Slices 6" Designer Cut-Outs. 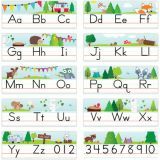 These cut-outs are great for creating bulletin boards about science, nature, trees, and camping. 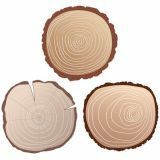 The natural look of these wood slices makes them ideal for classrooms using the Reggio-Emilia approach in which the environment is the first teacher. 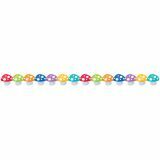 Use them in science projects, art projects, or other craft projects. Get inspired with Chevron! 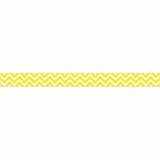 The vibrant color and modern design of this Yellow Chevron Border will be a bright trim on any bulletin board or classroom display. 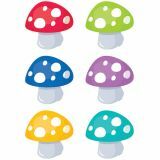 Add eye-catching flair to bulletin boards in an office, a senior living residence, a college dorm, or a Sunday school classroom with this bold pattern! Mix and match this color with other Designer Décor Collections.